Gateway for data reading from energy meters with DLMS protocol and for the conversion in Modbus protocol, both TCP and RTU. Gateway for the fast reading of data from meters with DLMS protocol. Instantenous conversion of reading in Modbus TCP or RTU. The DLMS protocol (Device Language Message Specification) is used in the context of the meters and in particular of energy meters for the reading of operating data. The reference standard is IEC 62056. It si based on services that allows to read the objects, definided OBIS,into which are mapped the operating values of the meters according to standard profiles. 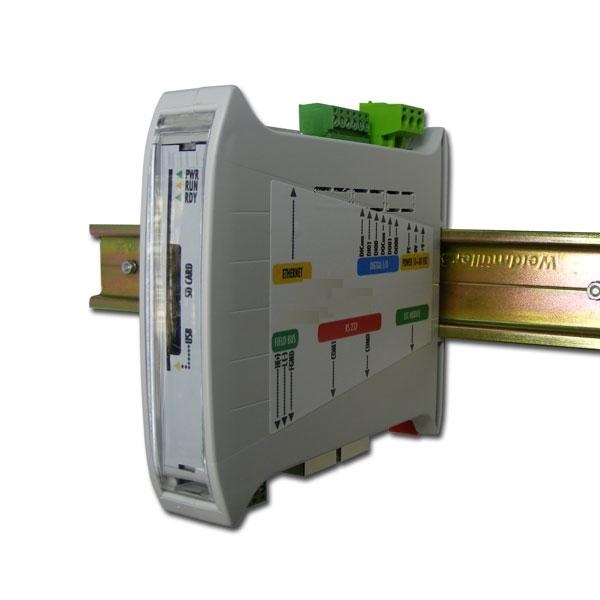 Marcom provides a DLMS-MODBUS gateway through which is possible to read by communicating with MODBUS RTU or MODBUS TCP protocol, data provided by the meter equipped with DLMS protocol. for further meters is required phone number for test. Version available for connection via optical probe (IEC 1107). Configuration Modbus registers for the setting of the serial number of the meter. Possibility on demand to provide frameworks of field complete of cables and the accessories for the functioning.Look Photo. Prices shown are already without VAT. Copyright © 2019 Shop Online - Marcom S.r.l.. All Rights Reserved.